Our 2018 Club Kit has arrived! The new logo maintains the original idea of “CHIG” and the MITRE, but with a modern twist by using lines and geometrical figures. This part of the design was inspired by the lines used on the competition maps to represent a course. On the top of the left hand sleeve, a ‘triangle’ with vertical lines and a hidden optical illusion that has the MITRE of the logo on it. Contours from the Epping East map. 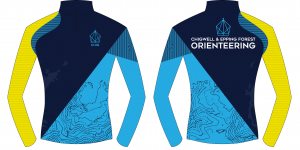 On the back of the top, the titles “Chigwell & Epping Forest Orienteering” are displayed in large and with the logo on top of it. We are now accepting pre-orders for the first batch of the kit. As with previous kit, the club will part-subsidise the cost. We have ordered from ‘noname’’, and you can see the pre-production designs & available sizes here. The kit is available from Alan Brett and Ray Curtis or by completing the online order form.